Di466 responds to Canon's E-TTL, E-TTL II system, and Nikon's i-TTL system. 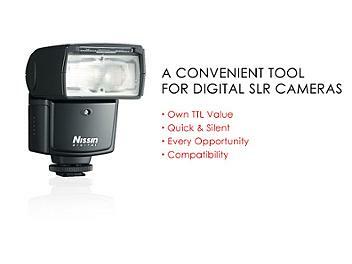 Those new digital TTL flash systems control the flash light with greater precision and stability. The TTL flash power level is pre-set for reasonable exposure at factory. You can, however, reset the power at the desired exposure level, in +-3/4Ev. by 1/4Ev increments. The preset value is memorized as your personal standard after switching the unit off. This unique system for customizing your level settings, called MY TTL, is a feature exclusive to Nissin. The usual TTL flash level compensation works based on this customized level. The Di466 has a dual energy saving system. It automatically enters sleep mode when it's not in use for 5 min., and is reset with a touch of the shutter button or any button of the flash. If the unit is not in use for 30 minutes, it will automatically power off. With the flash unit set for slave mode, sleep mode is cancelled and the automatic turn off timing is prolonged to 60 minutes. When selecting manual power operation, choose from one of the six variable powers for the best lighting effect. The power level is provided from full power down to 1/32nd power in 1.0Ev increments. In darkness or dim light conditions, the Di466 beams an orange LED light to create a sharp contrast to enable the camera's focus sensor to focus easily on the subject. The Di466 has a guide rail for filters. Color filters and density filters can slide into the slot provided at the front of flash window. The Di466 is compatible with either the FE lock (Canon) or FV lock (Nikon) system. Refer to the camera owner's manual for details. *Nikon and some Canon cameras set the flash for rear curtain synch. photography. *The Di466 follows the command signal of the these cameras. Available with Nikon cameras only. A small flash beam is automatically produced for short distance portrait shots to prevent the red-eye phenomenon. AF Assist light : Orange LED for distance of 0.7 to 6 meter. Flash duration : 1/800sec. to 1/20,000sec.